Phil Freedman swept into town like a summer monsoon a couple years ago, deciding to move here from San Diego to be with his daughter Carina, who had enrolled at Arizona State University. Phil is a big personality and a lifetime sailor, so it was no surprise that he grabbed hold of the ASU sailing team and suddenly transformed it into something much bigger than it had been. He bought boats, “branded” the team with signs and clothes, and recruited lots of kids, most of whom had never sailed before. Along the way, Emory Heisler recruited Phil to be Vice Commodore. Unfortunately, simultaneously, Phil was fighting some serious health problems that seem to have only gotten worse since. He resigned from the AYC board and hasn’t been able to give the ASU sailing team as much help as he wanted. But he wrote and published a book. 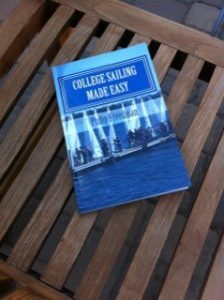 It’s called College Sailing Made Easy, a banquet of thoughts, ideas, suggestions, and concepts to help field a college racing team. Illustrated with cartoons and drawings and punctuated with humor, it covers everything from sail trim to how to order T-shirts. And it concludes with pictures of Phil’s favorite time sailing—when he actually fielded and drove a 12-meter America’s Cup challenger in San Diego. If you’d like a copy of the book, contact Phil at this email or it’s available at Amazon for $12.95.